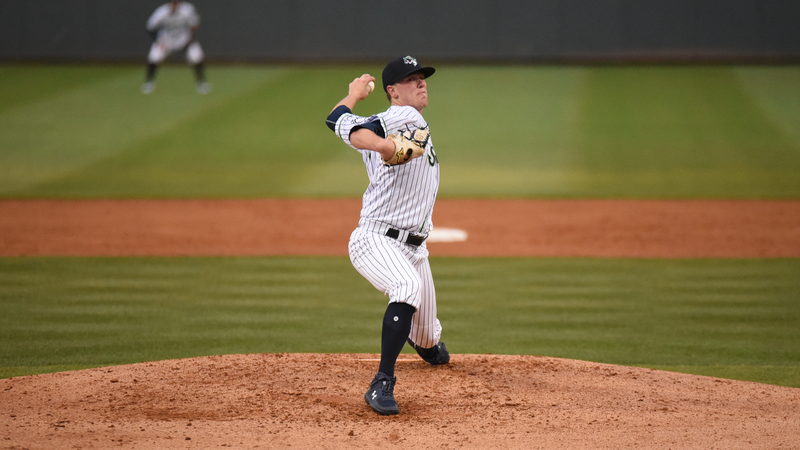 LAWRENCEVILLE, Ga. - Kolby Allard pitched 5.2 innings of one-run baseball and the Gwinnett Stripers (4-1) scored six first-inning runs in a 7-2 victory over the Durham Bulls (1-4) on Monday night at Coolray Field. Scoring Recap: In the first, the Stripers took a 3-0 lead on RBI doubles by Andres Blanco, Adam Duvall, and Ryan LaMarre off Bulls' starter Ryan Merritt (L, 0-1). LaMarre scored on a single by Raffy Lopez to give Gwinnett a 4-0 advantage. Sean Kazmar Jr. hit a two-run home run (1) to push the lead to 6-0. In the sixth, Mac James drove in a run for Durham to cut the Stripers' lead to 6-1. Gwinnett got the run back in the sixth as Blanco plated his second run of the game with a single to make it 7-1. In the seventh, Mike Brosseau was hit by a pitch to bring in a run for the Bulls to make it 7-2. Stripers Stats: Allard (W, 1-0) earned his first win of the year as he pitched 5.2 innings with one unearned run on four hits and four strikeouts. Connor Johnstone and Grant Dayton came on in relief to pitch 2.0 and 1.0 scoreless innings, respectively. Kazmar Jr.'s homer was his first hit of the season as he finished 1-for-4 with two RBIs. Ortega fell a homer shy of the cycle, going 3-for-5 with a double, triple, and two runs. Blanco and LaMarre each went 2-for-4. Postgame Notes: With the win, the Stripers are in sole possession of first place in the International League South Division, a half-game ahead of Charlotte (3-1). Ortega has hit safely in all five games with the Stripers this season, batting .450 with four extra-base hits. Kazmar Jr.'s homer was his first since July 2, 2018, also against Durham. Quote: "Just tried to execute pitches," Allard said. "Could have executed a little better, but the defense did a good job behind me and it was a good team win." Next Game (Tuesday, April 9): Gwinnett vs. Durham, 12:05 p.m. at Coolray Field. RHP Mike Foltynewicz (1-0, 0.00 ERA) for the Stripers vs. RHP Jake Faria (0-0, 16.88 ERA) for the Bulls. Radio Broadcast: 11:50 a.m. on 97.7 and 93.5 FM "The Other Side of the River."